LCHS senior Solenn Matuska is the fourth Spartan to be honored with the CIF Southern Section Champions for Character Award. 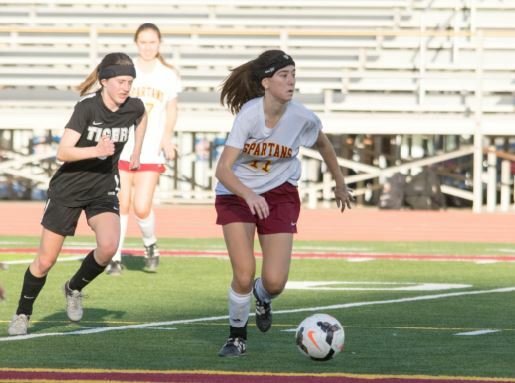 For the fourth consecutive year, a La Cañada High School student-athlete is among those given the CIF Southern Section Champions for Character Award. Solenn Matuska joins fellow Spartans Seve Rodriguez, Alexi Nazarian and Genevieve Fraipont in receiving the prestigious award. Athletes, coaches administrators, officials, athletic trainers and media members who demonstrate the Six Pillars of Character — trustworthiness, responsibility, respect, fairness, caring and citizenship — will be honored at a dinner at The Grand in Long Beach on Monday, Sept. 24. “It’s not just about excelling in your sport,” said LCHS Assistant Principal of Athletics and Discipline Kristina Kalb, who is 4-for-4 in nominating local athletes for the award. “It’s about being the best person you can be and demonstrating that to others in all that you do. Students involved in Champions for Character are performing well in the classroom, in athletic competition and doing more.